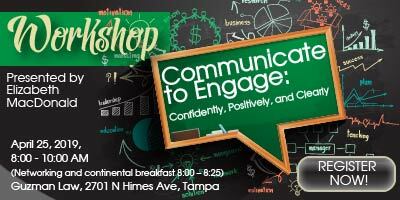 This workshop equips professionals with advanced verbal communication skills–non-verbal and verbal. The result: clear, succinct, positively-phrased, and confident communication when speaking, presenting, and writing professional emails. Communication Skills Advisor Elizabeth (Liza) MacDonald will present the workshop. Liza is the owner of The Verbal Edge and author of Sharpen Your Verbal Edge: 101 Tips to Enhance Professional Communication Skills.